Distribute religious literature to the citizens of Riften. Give out 20 The Warmth of Mara missives in Riften. Talk to Dinya Balu after the Book of Love quest and you will be able to provide her with some additional assistance. She will tell you "Riften is drowning in a sea of sin and wickedness and it's my personal mission to let everyone know that the warmth of Mara can see them through." Now, she needs a messenger to bring Mara's words to these poor souls by distributing some missives. Then, she will give you twenty "The Warmth of Mara" bulletins to give out to the citizens of Riften. You will need to hand out all twenty to complete the quest. Before you start the work, you may ask Dinya for some tips on who might accept the bulletins. She will tell you "Almost anyone in Riften is in dire need of those missives." However, it would be wise to keep away from Mistveil Keep and the city guards. There are a total of thirty-seven people that will accept the missives. You can talk to them "Here, brother/sister. Blessings of Mara upon you." Although their reactions vary widely, they will always accept them. Aerin I visit the temple sometimes, but perhaps not often enough. Thanks for bringing this to me. Alessandra Oh, a new pamphlet from Dinya? I'll be glad to read it. Thanks. Asbjorn Fire-Tamer Oh, well thank you. I'll try and read this if I can. Asgeir Snow-Shod Not really my usual read, but I'll give it a try. Balimund Thank you for the blessing, I'll put this to good use. Bersi Honey-Hand If only more people would read this, things might be better in Riften. Bolli Thank you. Blessings of Mara upon you as well. Brand-Shei Mara can't help me. No one can. Dirge I think I have some more of these padding my mattress. Drifa Oh, how kind! Thank you. Elgrim I have no time for Marla or Mara or whatever her name is... there's work to be done! From-Deepest-Fathoms I have no desire to seek religion. Grelod the Kind Unless Mara wishes to come down and help me with these urchins, I don't really give a damn about her blessings. Haelga Huh? Oh. Sure, whatever. I prefer Dibella's teachings myself. Hafjorg Hmmm. Never read anything from the temple before. I suppose there wouldn't be any harm in reading it. Hemming Black-Briar I don't understand how paper will help the dregs of this city, but suit yourself. Indaryn What's this nonsense? Bah. Ingun Black-Briar Whatever you're peddling, I'm not buying. 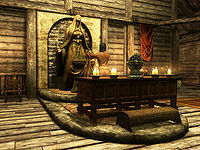 Keerava Look, the only religion I believe in is the good old septim. Everything else is just a waste. Louis Letrush I hold my own beliefs, but thanks anyway. Maven Black-Briar Excellent, I needed some more kindling for my kitchen hearth. Mjoll the Lioness Thank you. I'll share this with Aerin. Niluva Hlaalu Mara only helps those who can afford her tithes. This is nonsense. Nivenor Are you serious? You're as crazy as Maramal. Nura Snow-Shod Ugh. Get this awful paper away from me, by Talos! Romlyn Dreth I don't have time for this nonsense. Shadr I'll give it a try, thanks very much. Sibbi Black-Briar Do you take me for a fool? Get this drivel away from me! Svana Far-Shield Thank you. Umm, blessings upon you too. Talen-Jei Interesting. I'll look it over. Thanks. Tythis Ulen Oh, interesting. I'll read it this evening. Ungrien I'll read it. Thank you. Valindor Seems like a noble cause, I'll look it over. Vipir the Fleet Are you out of your mind? Vulwulf Snow-Shod Mara this and Mara that. Where is she when hundreds of Stormcloaks are dying for no good reason, eh? Wujeeta I wouldn't even clean my tail with this trash. Return to Dinya and tell her that you've given away all the missives. She will be quite pleased "Oh, splendid! Just splendid! Mara smiles upon us this day." Then, she will reward you with a random potion. From-Deepest-Fathoms is incorrectly referred to as "brother" when handing her a flier. After you've delivered the 20 missives and return to Dinya Balu, you'll be presented with a dialogue option that says you've run out of missives and require more. If you select this option instead of saying you've delivered them all, Dinya will praise your diligence and give you 5 more missives, which can optionally be passed out. When you deliver each of these "extra" missives, the "Completed" quest update notification will re-appear, along with the (total/20) count (i.e. 25/20 after you've delivered the last one). However, if you return to Dinya after delivering the extra missives and tell her you've delivered them all, the dialogue and reward will be identical to what you would have received had you not delivered the extra ones. While it doesn't hurt you to do this, there's no actual benefit. Furthermore, you may or may not be given the "extra" option again; some players report seeing this happen while others report that they only got the option once. It appears as though an additional reward was intended but was never actually implemented. After handing over 19 missives, the option to hand over 20th may not show. The quest is stuck at this point, and the only way to advance is through console. The following empty quest stages were omitted from the table: 10, 25, 200, 250. On the PC, it is possible to use the console to advance through the quest by entering setstage FreeformRiften05 stage, where stage is the number of the stage you wish to complete. It is not possible to un-complete (i.e. go back) quest stages, but it is possible to clear all stages of the quest using resetquest FreeformRiften05. This page was last modified on 14 April 2019, at 20:23.